There are miscellaneous piping materials made from Monel 400 (UNS N04400, 67Ni-30Cu). These materials can be used in boiler or pressure vessel applications according to relative ASME Boil & Pressure Vessel Code(BPVC). 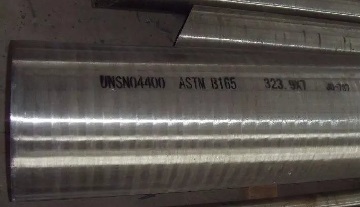 ASTM B165 UNS N04400(Monel 400) seamless pipe, 323.9mm x 7mm. *The Monel 400 bar & rod shall be furnished in annealed or hot-worked condition. 2. The plate shall be furnished in annealed or as-rolled condition. 3. The seamless pipe & tube, seamless & welded fittings shall be annealed or stress-relieving condition. According to ASME BPVC Section II Part D, Monel 400 is not applicable to the construction of power boilers(ASME BPVC Section I). It is mainly used for construction of nuclear facility components(ASME BPVC Section III), construction of pressure vessels(ASME BPVC Section VIII, Division 1), and transport tanks(ASME BPVC Section XII). The max. temperature limits are listed in below table. *Seamless & welded Monel 400 fittings are not permitted to be used in applications of ASME BPVC Section III.